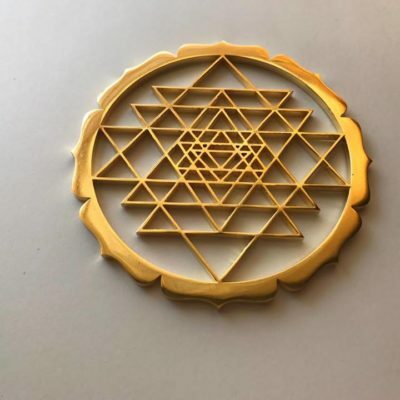 64 Star Tehtrahedron Grid is a 3.3 inch (8,5 cm) diameter handcrafted Tool that is Gold 24k plated. The 64 tetrahedron grid is the seed geometry of what eventually becomes, with more and more octave growth, the infinite holofractographic vacuum structure of the entire universe. 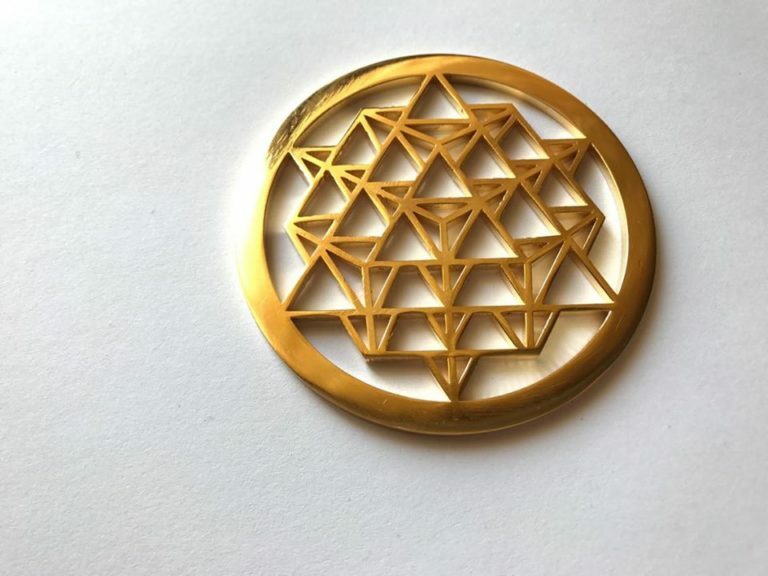 The star tetrahedron -also known as the merkaba vehicle of light – represent the innermost law of the physical world: the inseparable relationship between the two complementary halves – the positive and negative, the manifest and the unmanifest – which form a perfect equilibrium. In creation they rule as two opposite laws: the law of spirit and the law of matter. A 64 tetrahedron, as the name suggests, is a combination of 64 tetrahedrons. Tetrahedrons are pyramids with a triangular base with each side being an equilateral triangle. It can also created by combining multiple trees of life and overlaying a cube octahedron or vector equilibrium over top of it. A cube octahedron or vector equilibrium is a structure of perfect balance in physics where all vectors are forces cancel out to zero. Metaphysically the 64 tetrahedron is symbolic to linking up our individual spiritual paths with our star or soul family in perfect harmony. It holds this energy due to its combination of tree’s of life which are symbolic to an individuals path to Source or God. The overlay of the vector equilibrium reminds us not only to simply come together, but to come together with the same definite chief aim in perfect balance. 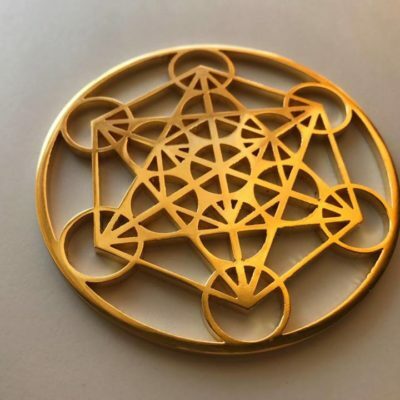 Connecting with your soul or star family in harmony will amplify each individuals energy and power to accomplish each others goals with maximum efficiency. 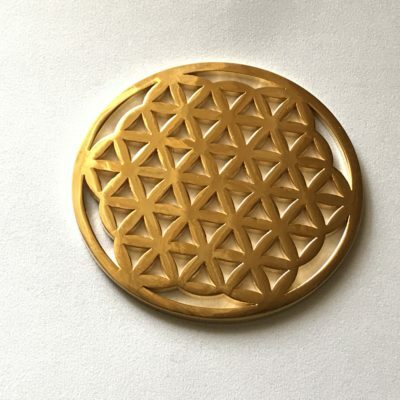 It can also be seen as a symbol of the masculine counterpart to the Flower of life because curves are seen as feminine and straight lines are seen as masculine. 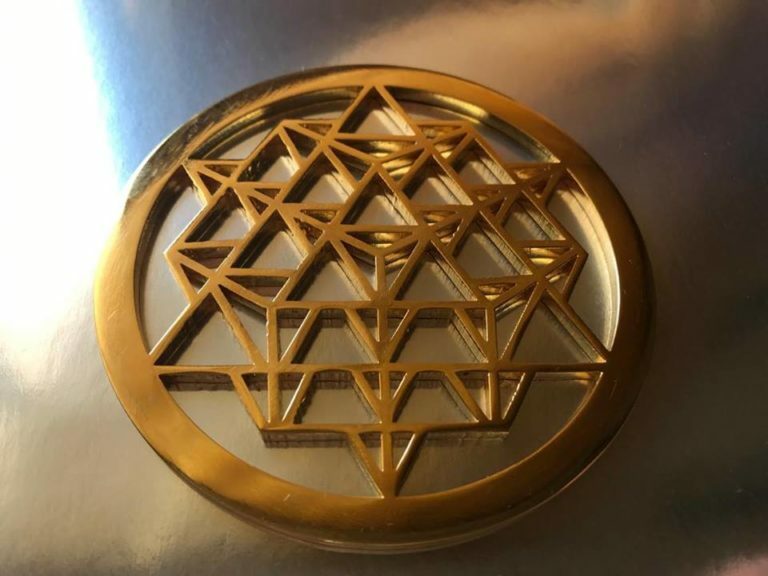 The 64 Tetrahedron and Flower of Life overlay perfectly! 64 Tetrahedron Grid is the true structure of the vacuum. The grid 64 tetrahedron is a fractal structure that continues to grow endlessly. It’s the only three-dimensional fractal structure which generates expansion and contraction. The fundamental structure of space. The holofractal structure of the universal vacuum. 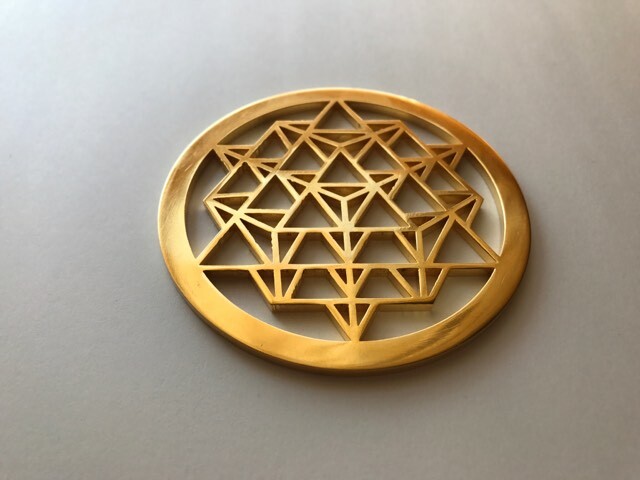 This geometry is not only complete in it’s equilibrium, but when constructed of the 64 interlocked upright and downward facing tetrahedrons matches up perfectly with another ancient symbol: The Flower of Life. • 64 codons in human DNA. • 64 hexagrams in the I Ching. • 64 classical arts listed in many Indian scriptures. • 64 “tantras” (books) of the “tantrism”, which is a form of Hinduism. • 64 is the maximum number of strokes in any Chinese character. • 64 is the number of cells we have before our cells start to bifurcate (differentiate) shortly after conception. • 64 is encoded in the description of the Tetragrammaton in the Hebrew Bible, which is the 4-letter theonym YHWH which means God in Hebrew. • 64 is the number of generations from Adam until Jesus according to the Gospel of Luke.